As we head into Week 8 of the NFL season, it’s time to step back and take a look at players worth dropping in fantasy football. Dropping players in typical redraft fantasy leagues is a necessary evil. Most redraft fantasy leagues have shallow benches and smart fantasy owners are constantly churning over the dead weight in favor of future potential. Holding onto a player for too long just burns a valuable hole on your bench. Adversely, you don’t want to let a player go right before his breakout. These types of articles are often league- and scoring-dependent, so to appeal to the masses, these are all going to be drops that I’d personally feel comfortable dropping in 12-team, PPR leagues. Your specific league and situation might be different, but these work as a general statement. Unfortunately for Yeldon, his days as the top running back option in Jacksonville appear to be over. 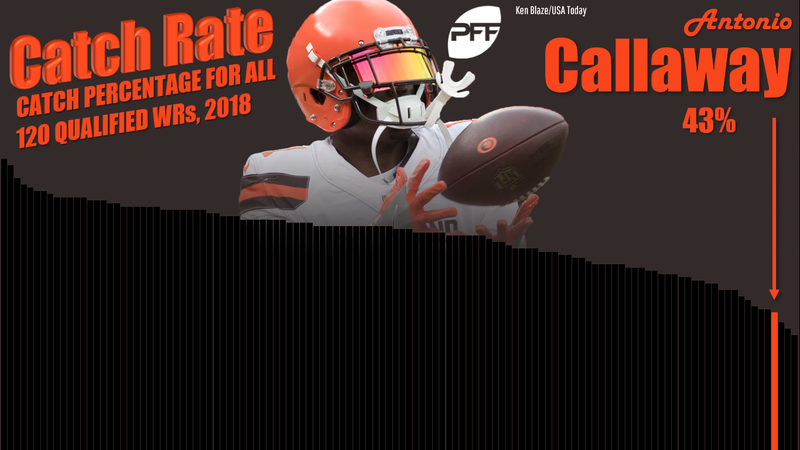 While he’s performed admirably during Leonard Fournette’s injury (while battling injuries of his own), the team’s addition of Carlos Hyde should make it clear as day that they prefer to utilize Yeldon in a timeshare. Actually, the fact that they signed Jamaal Charles (since cut) to help split touches should have told you that a few weeks ago. Hyde enters the fold averaging 19 carries per game in Cleveland and is sure to be a welcome addition to a team who’s passing is suddenly flooded with questions. If there’s a hot waiver-wire gem available, I wouldn’t be upset losing Yeldon in the exchange. We knew heading into the season that the coaching staff wasn’t willing to just hand over the starting gig to Freeman. What we didn’t know is that it would be rookie free agent Phillip Lindsay in the mix for heavy touches over the incumbent Devontae Booker. Freeman’s averaging just 10.7 touches per game and seeing 38.7% of the backfield touches. His 34.7% of snaps played looks even more elevated with Lindsay being ejected from a game. Lindsay also has more touches inside the 20-yard line and they’re tied at three touches apiece inside the opponent’s 5-yard line. Until Freeman starts seeing more touches and playing time, he’s likely a safe drop candidate at this point in the season. For those with short memories, if it weren’t for the Eagles being overcome with a litany of injuries at the running back position this preseason, Smallwood may not have ever made this final roster. Now that we’ve seen Corey Clement back in action over the past two weeks, Smallwood’s percentage of running back snaps and touches have both declined. Smallwood currently ranks as our No. 53 running back out of 59 qualifying and his 0.32 PPR fantasy points per opportunity ranks 57th of 72 qualifying. Clement’s return marks the downfall of Smallwood’s brief tenure as a fantasy-relevant back this season. Hogan was on the cusp of being a drop candidate during Week 6’s iteration of this article. He continues to find himself at the bottom of the target totem pole, seeing just an 11.2% target share. This is with Julian Edelman sidelined for the first four games, Josh Gordon starting the year in Cleveland, and Rob Gronkowski missing last week’s game. He’s simply just not seeing enough targets to warrant rostering and is a safe drop in even 14-team leagues. Despite a slightly better target share than Hogan at 12.3%, Hurns is another player whose volume isn’t something that we can bank on from a week-to-week perspective. Now that Amari Cooper is joining the Cowboys, that number could take a bigger hit. The Cowboys are one of the most run-heavy teams that operate at the slowest pace in the league. Diminished targets for Hurns turn him into an easy drop candidate starting this week. Outside of a Week 2 47-yard touchdown that put him on the map, Callaway has had a rather quiet start to the season. His 43% catch rate (16.2-yard average depth of target) ranks fourth-lowest among 120 qualifying receivers as he’s been unable to connect early throughout the beginning of the season. Callaway is firmly entrenched as the WR2, but his 13.7% target share (5.3 targets per game) makes him just a boom/bust candidate when combined with his high aDOT. He’s likely best served as daily fantasy tournament play until he and Baker Mayfield work on their rapport. If you’ve somehow made it to Week 8 with Doctson on your roster, your leaguemates should be thanking you for giving them a chance to stash better receivers. Doctson has yet to reach the end zone or score double-digit fantasy points in a game. Despite leading the team in routes run, his season-high receiving yards in a game is just 42 yards! The Redskins remain a ground-and-pound team (fifth-highest run play percentage) that ranks bottom-10 in red zone trips per game (3.0). There isn’t volume nor touchdown equity to chase with Doctson here. This is more of a praise on how well O.J. Howard is playing than any kind of bash on Brate. 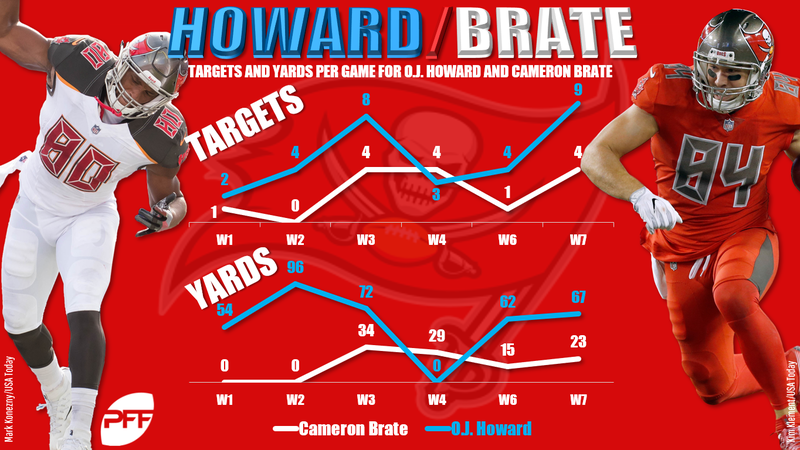 Despite battling injuries, Howard is doubling Brate in targets, receptions, and receiving yards — on nearly the same number of routes run. Howard’s 2.56 YPRR dwarf’s Brate’s 0.81 while possessing the deeper aDOT (12.4 to 9.8). Howard is seeing more volume and his targets are further downfield making them more valuable. Brate’s lack of target volume has relegated him to a touchdown-or-bust flier option who can be safely dropped in favor of better fantasy stashes.